Looks very impressive. Very good artwork, did you do it yourself? Did you try to connect it to Ringman's hires Wolf3D enemy work? All enemies (8dir) and Bosses were done already. Any SOD Mission One screenshots? I've unveiled two hi-res rock images that SOD seemed to have used as a base when making 64x64 walls. These were extracted from a Doom Hi-res pack some place; I've long since lost its original source and author. hires sprites looks awesome. better than some old addons like wolfcu.pk3 (dont remember the author). but game plays little slow than usual. its good to take time to attack enemies lol. i am trying to include this in all ecwolf compatible mods and play. 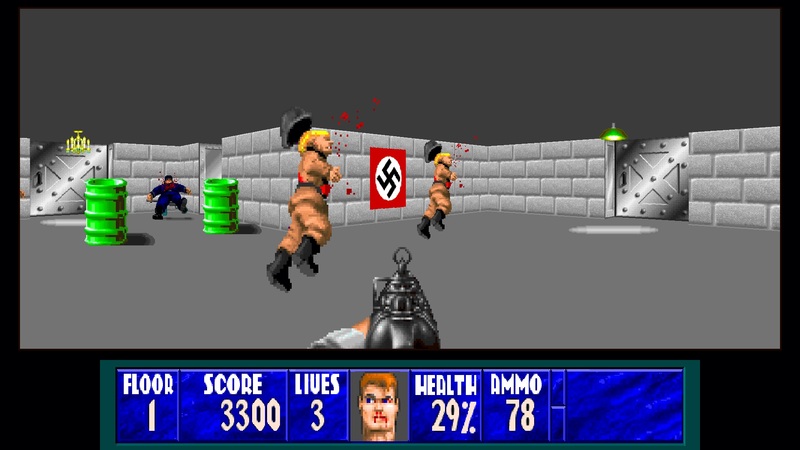 look what happened when added this remaster highres sprites to the game Amerika_PC (ecwolf version). enemies die on keep floating in air. i am using following command to start game "ecwolf --data wl6 --file ATB_PC_Source.bin amerika_fix_PC.pk3 ECWolf_RMST.pk3 ECWolf_RMST_SFX.pk3 ECWolf_RMST_CoffeFix.pk3"
You should upload screenshots with proper aspect ratio. The ones you uploaded are squashed horizontally. What resolution are the textures and sprites? that is 1920 x 1080 full hd resolution. that is my monitor highest resolution it can display. Very good artwork, did you do it yourself? Yep, I used Ringman's excellent rotation sprites. 95% of the stuff done for Wolf3D and Spear of Destiny were extracted / made by other members of the community at zdoom (all credited on the readme, I hope - sorry If I forgot someone), while some 90% of the stuff done for the Mission Packs (a.k.a. Lost Episodes) were done by me, but the latter had still some sprites and textures left to finish, hence why I said I was releasing "what I have already" instead of "the full version", since I have no plans for future updates. There's two screenshots in the main topic (labeled "spear2") but none with rock textures. I manually edited the first rock texture that the player encounter on Mission Pack 1, though I wasn't very happy with the result since it just ended looking like the original texture with a algorithm filter, but it's included in the pack anyway. Unfortunately, I'd have to look into every specific mod released for ECWolf to check if something could "break", like in the example above, and make separated patches for each one (like I did with Coffe Break's chaingun animation), which is the reason just a few mods are officially supported (I dropped that idea not much later, heh). In the example you posted, it's likely that the author of the mod reused the default names for the death animation sprites and this caused the wrong sprites to be replaced. EDIT: It might work better if you put "ATB_PC_Source.bin amerika_fix_PC.pk3" at the end to load last so the mod configuration will overlap the high-res addon, but then again it might overlap everything. Still worth a try. 128x128, double (or quadruple? whatever) the original 64x64 from WOLF3D. your suggestion not worked properly. as you said your sprites dominated and different enemies wearing same dresses. there is no floating of dead in air. 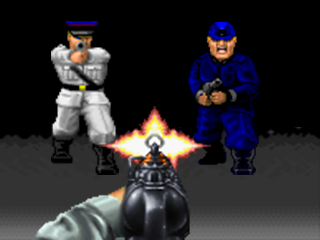 But copy the front standing frame and name it, for example; SSSTA0, because in Mac WOLF3D, enemies have no spawned direction, and if you make them stand with rotations, they'll all face east. Copy the A_Look parameters from a boss or a Mac enemy to make them see in all directions, and you're all set! I've since found the original Doom hi-res textures pack. The "bubble rock" textures are in the "flats" directory, and they're called FLAT5_7 and FLAT 5_8. I have yet to find the hi-res equivalent of that grey rock wall with diagonal "slashes", but I can probably recreate a hi-res version with my Texture Generator. Same goes for the white wall with wood trim. The "pink brick" has a hundred thousand versions out there that exist in different colors. I'd recommend just "grey-scaing" one of the images and recoloring it with the pink colors ... though a purple shade would be more appealing to me personally. The hi-res pack is called "Doom High-resolution Texture Project". The license says "do not redistribute", but it doesn't say anything about using it as a base for non-Doom projects. So I don't know where these graphics stand as far as this mod is concerned.